1. with 3pcs AA batteries, voltage 4.5V, standby life reaches up to more than 2 months, more than 16 hours continuous lighting services. 2. 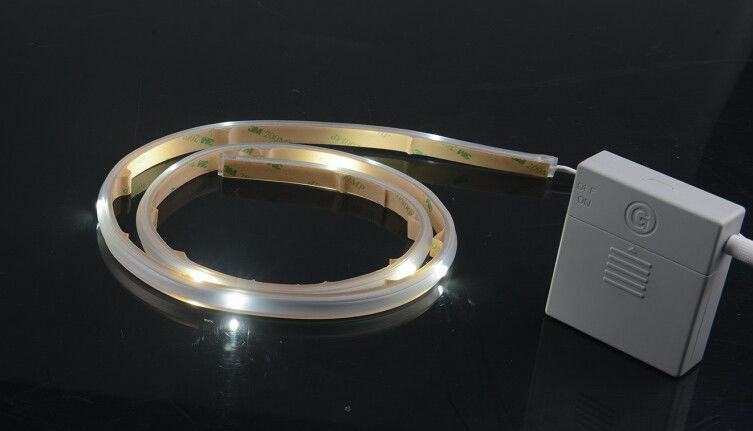 10pcs SMD2835 LEDs per strip, perfect for lighting up the entire trunk. 3. AA*3 square battery box + built-in control circuit + exterior LED strip, 3M velcro at the bottom of square box for easy installation. 4. Horizontal sensor: turn up or down in a horizontal direction, when the turning angle exceeds 40 degree, the light turns on automatically, the reaction time is 2-3 seconds. 5. Vertical sensor: turn left or right in a vertical direction, when the turning angle exceeds 40 degree, the light turns on automatically, reaction time is 2-3 seconds. 7. Rear velcro for box attachment. 8. Double-sided tape included for easy installation, just peel and stick onto any flat surface. The Truck Tool Box LED Lights is perfect For luggage box lighting, car trunk cargo area or interior illumination, so you can find everything you need very easy even in the night. 1. Read the manual of the Truck Tool Box LED Lights before installation. 2. For indoor use only. 3. Do not look directly at LEDs.